It’s time to start thinking about your Thanksgiving side dishes. You probably have family favorites that you make every year but here are a few other recipes for inspiration. Maybe one of these will make it onto your family’s list of favorites! Forget the canned mushroom soup and canned green beans. Except for the fried onions, this is made from scratch. Pour beans into a greased 9 x 13 inch baking pan. Combine Parmesan and breadcrumbs and sprinkle over casserole. Cover beans with foil and bake at 425°F. until heated through, about 25 minutes. Uncover, set oven to broil, and cook until top is golden brown, about 1 minute. 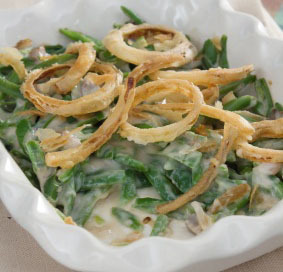 Sprinkle fried onions over top and serve immediately. Preheat oven to 350°. In a 12-inch cast iron skillet, melt 4 tablespoons butter over medium heat. Add the apples, and sauté in batches until lightly browned but still firm. Set the apples aside on a plate. In a large bowl, stir together the half and half, salt, pepper, cinnamon, and nutmeg. Toss the potatoes in the cream to coat. Preheat oven to 400°. Cut carrots and parsnips on the diagonal into 1/4 inch slices. Whisk together olive oil, maple syrup, balsamic vinegar, salt and pepper in a large bowl. Toss with carrots and parsnips, and spread on a large, rimmed baking pan. Roast for 40 minutes or until vegetables are tender and browned, stirring halfway through roasting time. Serve garnished with parsley. This salad is as beautiful as it is delicous. Whisk first 4 ingredients in a bowl. Slowly drizzle in oil while whisking. Add salt and pepper to taste. Place lettuce, apple, pomegranate seeds and walnuts in a large bowl. Pour in vinaigrette and toss to coat. Garnish with blue cheese. Serves 4. Melt butter in heavy large deep skillet over high heat. Add squash and sauté for 1 minute. Add broth, syrup, cinnamon, salt, and pepper. Bring to boil, cover, reduce heat to medium, and cook until squash is almost tender, about 10 minutes. Using slotted spoon, transfer squash to large bowl. Boil liquid in skillet until thickened, 3 to 4 minutes. Return squash to pan and cook until tender, turning occasionally, another 5 minutes. Preheat oven to 400°F. Place butternut squash cubes and olive oil in large bowl; sprinkle with salt and pepper and toss to coat. Spread out squash cubes on large rimmed baking sheet. Roast until just tender and beginning to brown, stirring occasionally, about 35 minutes. Heat oil in large pot over medium heat. Add onion, and cook 10 to 15 minutes, or until soft and beginning to brown. Add garlic, and cook 1 minute, or until fragrant. Stir in kale and broth. Cover, and cook 30 minutes, or until kale is tender. Season with salt and pepper. DO AHEAD: cool, and store in airtight container. Just before serving, reheat kale mixture, then drizzle with vinegar, and sprinkle with almonds. Put kasha in bowl and add 1/2 of the beaten eggs, stirring until eggs are absorbed. Turn into a cold skillet and slowly heat, stirring frequently, until kasha grains are dry and separate and just beginning to brown. Pour in boiling water, boiling broth and salt. Stir once, then simmer, covered, over low heat until all the liquid is absorbed and the kasha is half cooked, about 10 minutes. Meanwhile, heat oil in skillet and saute the onion until softened but not browned. Add mushrooms, raise the heat and saute for a minute or two, until liquid evaporates. Toss in parsley, cranberries and walnuts. Combine sauteed onion and mushroom mixture with kasha and stir. Taste and adjust seasoning with salt and pepper. Stir in remaining beaten eggs. DO AHEAD: before roasting stuff into a 10 to 15 pound turkey and cook according to package directions. Or spread in a greased casserole dish and bake, covered, for 45 – 60 minutes at 350°F. Heat oil in a large pot over medium heat. Add onions and celery; cook, stirring often, until softened, about 10 minutes. Add garlic, cinnamon and allspice; cook, stirring, for 1 minute. Add bulgur and stir for a few seconds. Add broth, bay leaf and salt; bring to a simmer. Reduce heat to low, cover and simmer until the bulgur is tender and liquid has been absorbed, 15 to 20 minutes. Toast hazelnuts in a small dry skillet over medium-low heat, stirring constantly, until light golden and fragrant, 2 to 3 minutes. When the bulgur is ready, discard the bay leaf. Add the cranberries, toasted hazelnuts, parsley and pepper; fluff with a fork. In a large, deep sauté pan, fry the bacon over medium heat. Just before the bacon turns crispy, add the onion and cook until softened, about 8 minutes. Add the garlic, paprika and rosemary and cook, stirring, until fragrant, about 2 minutes. Add the green beans, diced tomatoes and their juices and the chicken broth and bring to a boil. Reduce heat to low, cover, and simmer, stirring occasionally, until the green beans are very tender, about 40 minutes. Season with salt and hot sauce. Serve with mashed potatoes or rice. This is an outstanding sweet potato dish, not like the one with mashed sweet potatoes and marshmallows on top. This one is a keeper. Brown bacon in a cast iron pan until crispy. Remove bacon with a slotted spoon and set aside. Reserve bacon fat. You should have about 2 tablespoons. In large bowl, combine cauliflower and Brussels sprouts. Drizzle bacon fat on top. Add rosemary, salt and pepper and toss well. Preheat oven to 450°F. Spread vegetables in single layer on large baking sheet with sides. Roast until vegetables are tender and beginning to brown at edges, about 20 – 22 minutes, stirring halfway through. Serve immediately with reserved bacon.